Author: ROOMS.bg , 1.1 km From Kazanlak. Thracian tomb discovered in the town of Kazanlak is a round brick tomb near the ancient capital Sevtopolis Adrianopolitan kingdom is part of a large necropolis, the unique ancient monument back in the late fourth century BC. The tomb was created by the Thracian ruler Roigos in the depths of a natural hill hill was accidentally discovered by a group of soldiers in digging a trench under a mound on April 19, 1944. the northeast edge of town. During the excavation of the hill Tyulbeto come to the old brick wall, they continued to dig and found a round vaulted room, began studies of archaeologists and found the presence of precious Thracian finds. It is extremely valuable not only for our country, but has great international significance which is included in 1979 in the UNESCO World Cultural and Natural Heritage. Similar beehive tombs are found in Asia Minor, Southern Russia, but open in Kazanlak is best preserved, access is restricted in order to preserve an authentic and protected from demolition. Low narrow corridor leads to the hull - a burial chamber with a beehive-like dome-campanulate, built of rectangular bricks, which are circular in cross trapezoidal room, sandwiched with mortar. Stone shirt roof structure, two parallel walls forming porch length 2.60 meters and 1.80 meters wide leading to the camera. They found bones of a horse in the tomb and remains of a man and woman are found relatively few items, so it is assumed that she was robbed. The preserved artifacts speak of knowledge and mastery of the Thracians, under a thick layer of dirt and dust from archaeological excavations have taken gold buttons, gold beads from clay, small clay heads with colorful decorations, greater rosette with twenty-eight gilt on the front petals, gold jewelery, part of iron bridle tipped up and rusty pieces of sword. There are two sacrificial hearths bearing the imprint of sacrifice, ritual and pottery. What astonishes and makes it so significant are rannoelinistichnata era murals that reflect the life, military achievements, and pictures of the views of the unknown artist for the afterlife of the ruler on her. 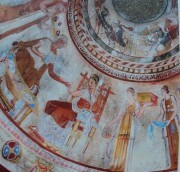 Ancient frescoes are ornate and occupy an area about 40 square meters, are four basic colors-black, yellow, red and white, depicts a decorative and figurative painting, used a technique in which plaster has gained luster decoration is gorgeous with marble slabs and original architectural details, the scenes depict mostly military, mythological scenes and horses. Central to this is the image of man and woman sitting in front of a lavish feast, and around them are different people bearing gifts, with unmatched excellence stands an image of the chariot horses. In the dome room depicts a multi extensive composition at the top of the dome, at a gallop race several riders. To protect the awesome beauty in 1946g.grobnitsata is embedded in a special building air conditioning system is installed to maintain the conditions necessary to preserve the murals. Designed by architect Mladen Panchev was built near the original tomb copy. In her artist Luben Prashkov Zlatka Kojouharova Fame and Voykov are recreated with extreme accuracy ancient frescoes. She is listed in the Hundred National Tourist Sites of Bulgaria. Kazanlak Valley keeps mighty Thracian culture, the preserved temples, tombs and temples are over twenty, some of the relics found there are at the history museum "Iskra" in the city.